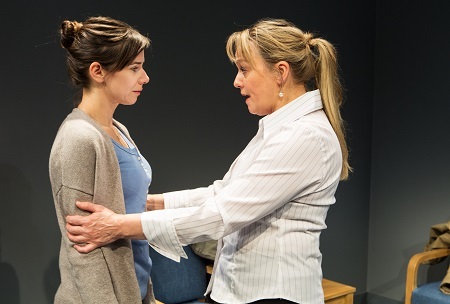 Waiting Room, playing at Tarragon Theatre is a play about a baby with cancer. “Baby with cancer” has to rank high, if not at the top, of any list made of The Three Most Heart-Breaking Words. Playwright Diane Flacks, who has herself spent time in the NICU with her son, has created a world inside a hospital where tense parents weigh suffering and cognitive damage against the hope of life for their infant; where unlikely friendships form and prove to be necessary support; where doctors, as diverse as humans are, can be brash and more interested in science than compassion, or sensitive and torn, or calm professionals. Chrissie (Michelle Monteith) and Jeremy (Jordan Pettle) have a fourteen-month-old daughter, Jessie, who has brain cancer. Jeremy copes by looking up information on the internet, and becomes fixated on a new approach that is not yet ready to be tested on humans. Chrissie is fixated on being able to hold her child, which cannot be done due to all the intubations and intravenous drips; she is also helped by the company of Brenda (Jane Spidell). Brenda’s son is older, and now cancer-free, but has gotten into an accident and is back in Sick Kids again. One of the play’s subtle lessons; childhood cancer never really leaves you (or your parents): any accident can send you back to the same doctors because it might have affected the shunt left in you, or something like that. Jessie’s primary care doctor is Andre (Ari Cohen) who has discovered that he is developing a brain condition of his own – early onset Alzheimer’s. He enlists the doctor under him – both literally and figuratively – Melissa (Jenny Young) to help him on a experimental treatment that, like Jeremy’s obsession, is not at the human-testing stage yet. They keep this secret from everyone, especially their boss, Dr Aayan (Warona Setshwaelo), but Melissa insists on being involved in all decisions as Andre’s mental faculties degrade. As his condition worsens, his passion for preserving life takes more and more precedence over any other factor, affecting the hospital’s care for Jessie and the information that is relayed to Chrissie and Jeremy about their child’s prognosis. As emotional as it sounds in synopsis, the play is a slow-burn at getting the audience invested in its characters. At first I was concerned that it would fall flat, but by intermission my fears were assuaged and by the end I was entirely absorbed. Ultimately, I think the distinct, gradual build benefits the show, if for no other reason that it is true to the hospital experience. It also intensifies the devastating climax: Brenda’s last interactions, first with Dr. Aayan and then with Chrissie, left me weeping in my seat. I might be more susceptible to the pathos of this show than others, as the parent of a young son myself, but I cannot imagine that anyone would be unmoved by the scenarios and relationships depicted in Waiting Room. Pack your tissues before leaving for the theatre.